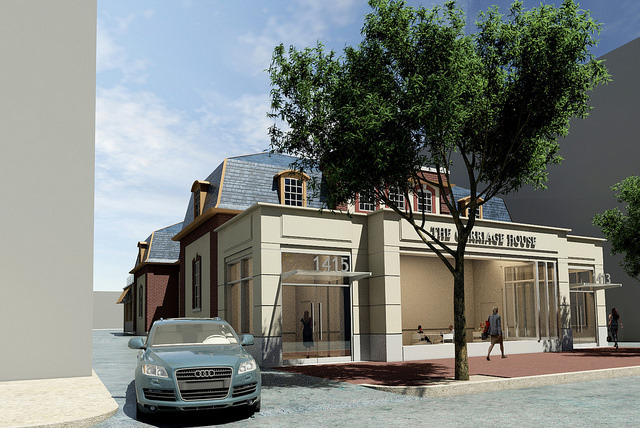 “Rock Creek Property Group breaks ground this week on the restoration of the landmarked Codman Carriage House in Dupont Circle. Located at 1415 22nd Street, NW, the building sits at a prime connection point between two of DC’s most storied and established neighborhoods – Georgetown and Dupont Circle. Architect Ogden Codman, Jr. originally designed the carriage house for his socialite cousin, Martha. Martha Codman spent the winters in the District in her nearby mansion. The location of the carriage house near the entrance to Rock Creek Park proved the perfect location for her stable. Due to the building’s DC landmark status as well as its location next to Rock Creek Park, the proposed plans were reviewed by both the Historic Preservation Review Board and the Commission of Fine Arts. “Our goal with this property is to bring it back to life. After years of neglect, the original grandeur of the architecture was lost,” says Rock Creek Principal Gary Schlager, adding that the building is scheduled to deliver in April 2017. To preserve the property’s intended design, the original carriage house doors will be replicated, the façade repaired, certain windows will be restored and others replaced in a manner sensitive to the property’s historic nature. To create a modern interior, skylights will be integrated into the building on the second floor, and soaring 10- to 15-foot ceilings will open up the space. Additionally, at the rear of the property there will be a large roof deck, accessed by the second floor. The property’s façade is currently covered by a concrete wall addition that was added in the 1940s, when it became a tire and car shop. To open up the front and expose more natural light, the building will feature a glass NanaWall system stretching through most of the property’s street front. OTJ Architects designed the project. Eichberg Construction will serve at the general contractor. “Given the historic nature of the Codman Carriage House, we put together a strong team with a creative eye and attention to detail that would work to both preserve and enhance this property,” says Schlager.